When you are suffering from debilitating pain from plantar fasciitis, you will want the most effective possible treatment to take away your pain. Heel pain can be particularly incapacitating, especially if you need to stand on your feet a lot at work and walk long distances. Plantar fasciitis is a specific pain in your heel that happens when you put a strain on your plantar fascia which is a ligament connects your toes to your heel. This ligament also supports the arch of your foot and when the ligament is strained, it can become swollen, weak and inflamed. Plantar fasciitis socks can give you extra pressure on the fascia ligament to help relieve the pain. Plantar fasciitis compression socks can be an easy way to supplement your treatment regimen, and they are a good alternative to massaging your foot and applying pressure to your heel all day. Many users feel that plantar fasciitis socks are very effective at reducing the pain associated with the condition, and they are definitely worth the money in their ability to reduce pain. These socks were created to support and strengthen the arch curvature that is similar to what an orthotic provides. If you are in pain, having the right arch support sock or sleeve can make a lot of difference. Especially if you sit for long periods of time, compression socks can become a valuable piece of clothing. Many people even wear them all night long to help stretch out their ligaments. 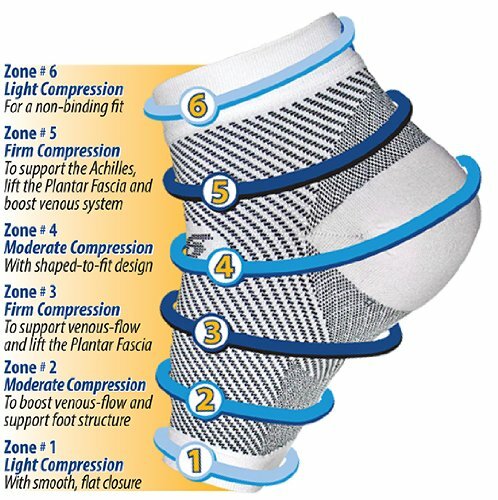 Here are a few tips on what to look for in the best plantar fasciitis compression stockings and a few reviews to help you start your search. If you suffer from plantar fasciitis, you can benefit from targeted compression that will relieve your swelling and pain. The FS6 Compression Foot Sleeve alleviates the pain in your heel and arch, plus it helps to ease heel spurs and swelling. With six target support zones, the OrthoSleeve provides three levels of compression that can give you the right amount of support where you need it most. Graduated compression starts at the ends with a comfortable fit that is non-binding and moderate compression is found at the heel and the ball of your foot with your arch and ankle receiving firm compression. The soft, moisture-wicking fabric helps to increase your circulation while relieving swelling and foot pain. The OrthoSleeve is easy to put on with its lightweight nylon and spandex sleeve that will stretch to fit, and it can easily be worn with shoes or while you sleep. Although they may seem very tight when you first put them on, this is the best support to treat Plantar Fasciitis and aid in your recovery. The fabric will stretch in a few days to conform to your ankle, so you will be able to have all-day comfort. For the latest in “figure 8” compression technology, check out the SureSport® Ultra 8 compression foot sleeve. To increase stability, the new “figure 8” compression technology replicates taping the ankle to give you more relief and elevate the plantar fascia. You can wear the Ultra 8 Foot sleeve while you are sleeping, so you can wake up pain-free, or throughout the day during your normal activities. SureSport® also uses the newest technology of zone and graduated compression at 20-30 mm Hg, plus it uses Lycra and Coolmax, some of the highest quality materials that also dry quickly. If you are looking for good overall foot support without having to mess around with taping, the Ultra 8 will give you pain relief and comfort to symptoms of plantar fasciitis. Ultra 8 are comfortable enough to wear under socks and have a nice natural feeling that is lightweight, soft, and breathable. When you need a compression sleeve for an active lifestyle, check out the Feetures! 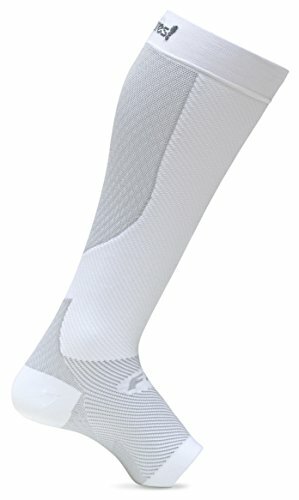 Plantar Fasciitis Sleeve Sock for its patent pending FS6 technology. The Feetures! 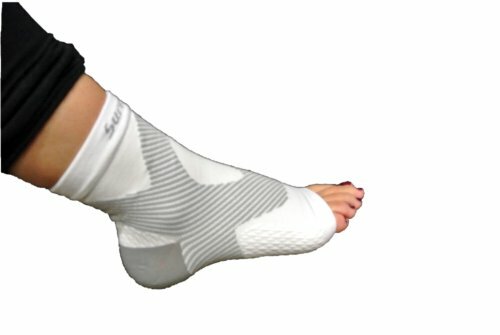 Sleeve Sock is able to stabilize and lift the plantar fascia to increase circulation and give you relief in the affected area. Plantar Fasciitis symptoms can be painful, and the Feetures! Sleeve Socks are comfortable enough to wear while you are sleeping to get rid of that morning heel pain. They are easy to put on and take off, and they are a convenient and effective way to get rid of Plantar Fasciitis symptoms. They are 100% Polyester with good support for your heel. If you are suffering from the nagging pain associated with Plantar Fasciitis, you need to have a good long-term foot care plan. The Sox Sport Plantar Fasciitis Compression Socks will stretch your Achilles tendon and plantar fascia and help facilitate healing. Your recovery is important and while you are massaging your feet and using heat packs you also need to remember to wear a good shoe with socks that will give you arch support. Walking around in flip flops are barefoot can slow your recovery, but wearing a pair of Sox Sport Plantar Fasciitis Compression Socks can improve your recovery and your performance in any sports activity. Although not a quick fix, the compression in Sox Sports socks has demonstrated to increase blood flow and help you react quicker, move faster, and require less energy. With Silver Drystat, these socks are infused with a natural bacteria resistant wicking material that is quick drying. When you have dry feet, you won’t have blisters, and the pre-washed socks use a chemical free softener for added comfort. Sox Sport Socks are great for going to the gym, running, walking, yoga, or standing. They are a good long term solution of to your plantar fasciitis pain and will help to relieve the discomfort that is associated with it. The Feetures! 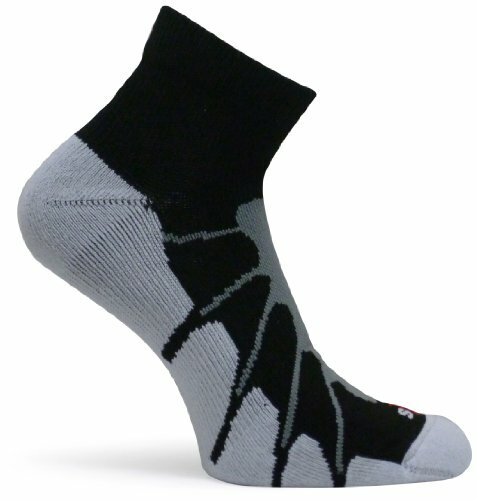 Elite Merino+ socks utilize their Elite technology in combination with their special blend of high-quality Merino wool and rayon that give their customers superb comfort. 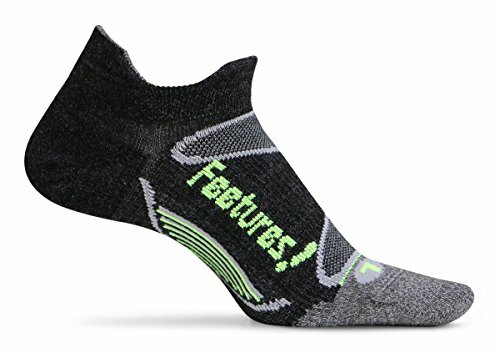 With natural anti-odor properties, the Feetures Elite Merino+ keeps your feet warm and dry in cold and damp weather condition. The patented Sock-Lock Technology gives you compression that is targeted where you need it most. Its anatomical design improves its fit and gives you the most comfort and protection by getting rid of blisters and the wicking fibers keep your feet dry and odor-free. High impact areas receive extra protection from high density cushioning helping to relieve pain and improve your comfort from symptoms associated with plantar fasciitis. Compression socks are a pain-relief option that can give you results that are almost as good as the total support you would get in an orthotic shoe insert or a quality shoe. They can give you a very snug and tight fit that provide stability for your foot and stretches the fascia ligaments at the same time which can reduce the pain you have when you wake up in the mornings. Benefits of compression socks can include being comfortable enough to wear while you sleep, plus they are minimally intrusive so you can wear them under your socks. Do Compression Socks Work for Plantar Fasciitis? There are degrees that compression socks have helped individuals with plantar fasciitis, but most consumers that have purchased compression socks have agreed that they do indeed help to relieve pain that is associated with plantar fasciitis. One thing to remember is that they should be a part of an overall strategy. They do help to relieve pain and they are cost-effective, but they may not be the total solution to your pain. Similar to tape, compression socks and sleeves lift and support your plantar fascia and correct your arch. Circulation is then increased by the compression of your ankle and foot which in turn helps to relieve your pain and inflammation. Socks for plantar fasciitis have the added bonus that you can wear them both day and night. If you stand all day at work, the compression socks can relieve pain in your heel and foot, and it can also help relieve the pain you wake up with as well. The first few steps in the morning can be painful, but wearing compression socks for your plantar fasciitis can help you have pain-free mornings. There are several good choices for plantar fasciitis socks to include with their overall strategy of dealing with plantar fasciitis. There are quite a few benefits from wearing plantar fasciitis compression socks that include relief of heel pain and swelling. Plantar fasciitis compression stockings are a simple, effective, and affordable way to help give you relief from your symptoms and help you get back to your normal, daily activities.